It’s become almost passé. “Oh, there’s a new mega-building going up somewhere in Asia? Yes, we know…it will be just fab.” Just how many times can they outdo themselves? Well, at least once more, it seems. Hong Kong’s futuristic, billion-dollar Kai Tak Cruise Terminal is set to sail – or at least, welcome sailors beginning in June. The stunning building designed by Lord Norman Foster (of Foster + Partners, responsible for Hearst Tower, Wembley Stadium, Supreme Court of Singapore & countless other architectural beauties) is eco-friendly, user-friendly and shutterbug-friendly with views across the eastern entrance of Victoria Harbour towards Kowloon and the famous Hong Kong skyline. If the name and location seem a bit familiar, the terminal is built at the end of what was a runway at Kai Tak Airport. Looking almost like a ship itself, Kai Tak Cruise Terminal will welcome passengers to Hong Kong with a public promenade, shops, restaurants and a rooftop park. Atop the three level structure is a park with large white “fins” that allow daylight to filter into the passenger waiting spaces. This built-in green space is just part of the eco-friendly design. Power is supplied by renewable resources, rainwater is recycled for use in cooling, and energy saving components are incorporated throughout the complex. The location is ideal for passengers visiting the city or embarking from Hong Kong; the terminal is just a few miles away from the major metropolitan areas of Hong Kong, and only three miles away from the Hung Hom Train Station for rail connections into China. The terminal complex itself will host shops and restaurants, and has large flexible spaces suitable for public use as performance venues or exhibition spaces to ensure year-round use. The first cruise berth at Kai Tak will open this year to accommodate ships up to nearly 1500 feet. (To help size that up, today’s longest cruise ships, Royal Caribbean’s Oasis of the Seas and Allure of the Seas are about 1187 feet long.) A second, slightly smaller berth will be available in 2014. That opens Hong Kong to much more cruise traffic and allows for much larger vessels than can dock at Ocean Terminal in Harbour City. Royal Caribbean International will be the first to take advantage of the new port, with Mariner of the Seas docking on 12 June. Voyager of the Seas, Celebrity Cruise’s Millennium, and Princess Cruises’ Diamond Princess will also call at Kai Tak this year, joined in 2014 by ships from Voyages of Discovery, Fred. Olsen Cruise Lines and Regent Seven Seas Cruises. 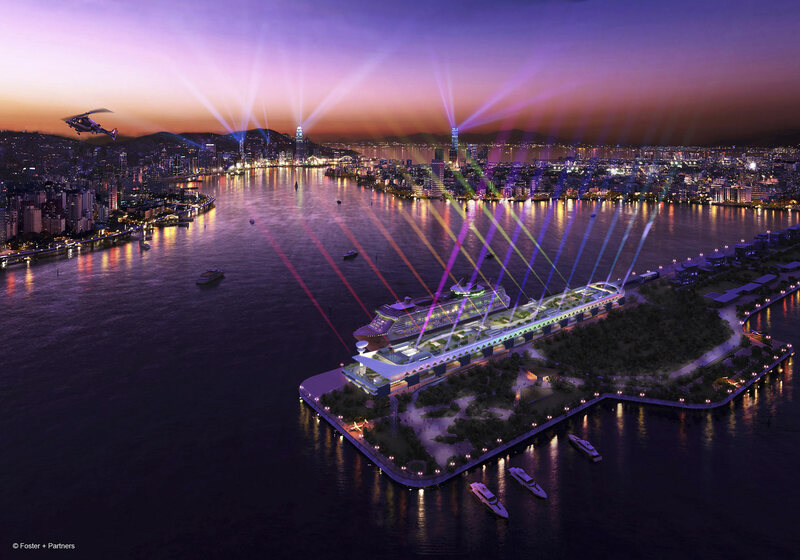 Situated on the eastern edge of the Kowloon Bay, Kai Tak Cruise Terminal promises a stunning sail away or arrival with breathtaking views of Victoria Harbour framed by Hong Kong and Kowloon. That’s a lot of growth in a fairly short time frame, a good indication that Asia’s cruise industry is booming. According to Bill Flora, Director – USA for the Hong Kong Tourism Board, Asian passengers could represent 20% of the global cruise market by 2020, and experienced cruisers from around the world, having been to Europe and the Caribbean, are looking for new destinations with Asia as a primary target. With Kai Tak open, Hong Kong is ready to welcome cruisers and set to become a regional cruising hub. Feedback Are you a cruiser looking for new shores? Whether you’ve cruised Europe and the Caribbean or not, how likely are you to book a regional or transcontinental Asian cruise? We’d love to hear your experiences, plans and thoughts in the comments! Tet Lion Dance Gallery – Vietnamese New Year #Travel140: Check Your Seat! Kai Tak Cruise Terminal has opened! 15 years after closing as an airport, the re-purposed terminal welcomed its first cruise ship, Royal Caribbean’s Mariner of the Seas on Wednesday night, June 12th.